On this date in 1859, five to six hundred folks braved a dreary Portland morning to witness the first execution in the state of Oregon — Oregon having graduated into statehood just that very year, as it says on the flag. Danford Balch, who would surely merit an entry in these pages for his name alone, had staked out a 345-acre land claim near the small settlement of Portland, but all that money couldn’t buy his daughter’s love. Anna, the eldest of nine kids at a blossoming 15, was amenable to a suit by the farmhand, one Mortimer Stump — this is a Dickensian roster of characters — and in the face of Papa Balch’s opposition, eloped with him over the Columbia River to Vancouver, Wash. So Danford Balch stewed, and drank, and was allegedly incited by his shrewish wife Mary Jane — this one has an ironically innocent moniker — until, encountering the Stumps in town for supplies one day, Danford Balch tried to retrieve his daughter and ended up shotgunning his unwanted son-in-law, right in the face. Bystanders tackled Balch immediately, though it took nine more months to bring the killer to trial: in these sparsely-populated frontier precincts justice was being administered on the old “assize” model of wandering judges who dropped in for a spell to try everything at one go. It was enough time for Balch to bust out of a rain-rotted jail cell once and get recaptured (once on the lam, he returned to his own home). When court was finally in session, conviction was a mere formality. He’d done the deed in public, after all. But the offended father seemed genuinely bewildered by the outcome: apart from the shooting being accidental (so he said), he clearly expected that a court would uphold the dominion of the family patriarch over his wayward progeny. Heaven knows what fumes he was fuming by the time he climbed the scaffold and beheld that naughty daughter Anna turned up to witness his hanging — sitting in the front row with the [rest of the] Stump family in what you have to think was a somewhat uncomfortable party for all concerned. Little more affectionate was the post-mortem behavior of the allegedly un-alienated part of the Balch clan. That widow Mary Jane, whom Danford hinted gave him quite a goading over their wanton daughter, shafted the remaining rugrats out of inheriting their chunks of the family land and instead routed most of it to her next husand. 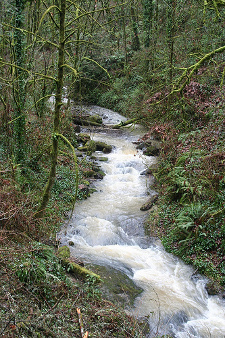 Balch Creek in Lower Macleay State Park. (cc) image from Brad Reber. Though pretty difficult to admire by the yardstick of human decency, that behavior turned out to be Danford Balch’s redeeming legacy. Today, it’s all part of the larger Forest Park, and it’s a lovely hiking space for a city that grooves on its outdoor rec … complete with a gorgeously ruined Depression-era stone ranger station that’s popularly believed to be haunted, maybe by the spirit of poor old Danford Balch himself. 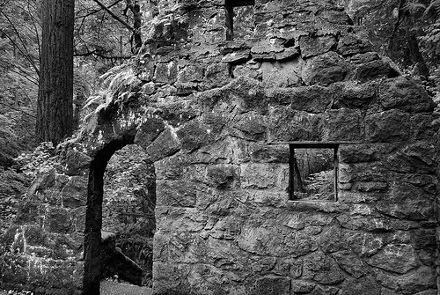 The haunted house … (cc) image from Adam Gaumont. There’s a Balchipedia for chronicling Balch family notables, so you know the first guy executed in Oregon is going to rate a mention.